CD Projekt RED has released the first screenshots of Blood & Wine, the upcoming major expansion pack for The Witcher 3: Wild Hunt. Take a look at them inside. The new setting, Toussaint, created for this expansion, is described as "carefree and colorful" but with the feeling that there's still some "dark stuff happening underneath". More information is expected for May. It looks a lot like a Witcher 3: Italy expansion. Can't wait, no release date yet? This expansion will be Uncharted 4's only real competition for GOTY. Yelp. I still need to play this game. Yes, you do...like REALLY do...like OMG do...what I'm trying to say is...you really need to play The Witcher 3 Wild Hunt. It looks a lot like a Witcher 3: Italy expansion. Touissant is supposed to resemble southern France, actually. A really Arthurian, romanticised version of the region, at that. 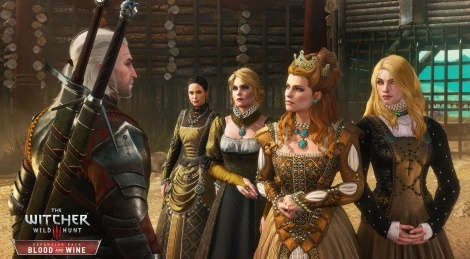 Everybody in the Witcher's world considers it an absurd fairy tale kingdom, and they're as tolerant, wealthy and happy as the rest of the world is bigoted, poor and wretched. But unlike most of the world, they have a ton of monsters hanging around and no proper military to deal with them, since they're basically a propaganda protectorate of Nilfgaard.